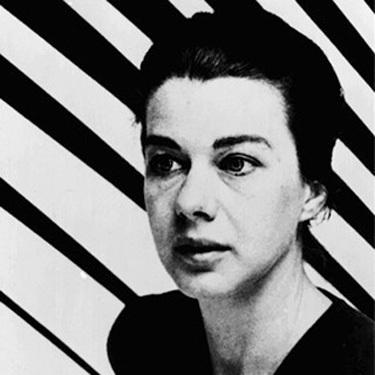 Bridget Riley is one of the foremost proponents of Op Art, and one of the most important and recognised living British artists. Her pictures, with optical effects expanded and amplified, repeated and concentrated, can be bewildering and beautiful, often straying into the lyrical since her turn to colour in the second half of the 1960s. That poetic dimension in her works is in part due to a childhood spent partly near Padstow, on the Cornish coast. She had moved there with part of her family after her father was called up for military service during the Second World War. Swimming in the sea and walking in nature both made a huge impact on Riley, and this would bubble through in her later works. Riley attended Goldsmiths College and the Royal College of Art during the 1950s, but her experiences there appear to have done little. She spent a number of years helping her father, who was recovering from injuries sustained in a serious car accident; following this, she entered a period of decline. She eventually recovered, and began to paint again, not least after her exposure to the abstract art being created on the other side of the Atlantic, which she saw in exhibitions in London in the late 1950s, for instance the 1958 show of Jackson Pollock’s works. In 1959, Riley was so struck by the show entitled The Developing Process at the ICA, which was co-curated by Victor Pasmore and Harry Thubron, that she enrolled in the summer school run by the latter. There, she also met Maurice de Sausmarez, under whom she was to teach at Loughborough School of Art; she also travelled with him to Italy. Under his guidance, she came to look at both the Old Masters and the Futurists, and crucially the Neo-Impressionist works of Georges Seurat. At this time, her own works remained figurative, or rooted in figuration, yet increasingly focused on the rhythms of the visual effects that she perceived in the world around her. In 1961, Riley pushed this to a new extreme, creating works that radically distilled the optical effects she had observed in nature and in Seurat alike, transforming them into geometric forms rendered in black and white. She created her early, often disconcerting works of Op Art using repetition to reinforce the impact of the effects of various rhythms and distortions. In 1965, two examples of her work were included in the show The Responsive Eye, held at the Museum of Modern Art in New York. Her picture Current, featuring undulating waves of black and white that give an almost vertiginous sense of churning movement, was used on the catalogue cover and even featured in a CBS documentary presented by Mike Wallace, which coincided with that exhibition. Soon afterwards, Riley began to reintroduce colour into her works. Often, strips or flows of colour stretch across the surface, which is sometimes made all the more dramatic by the use of large scale canvases and indeed mural compositions. This sense of monumentality was facilitated by Riley’s use of industrial spaces in London’s Docklands as her studios over a number of years. Riley’s works focused both on the visual effects of colour, and also the emotions that colour can evoke, not least depending on its various juxtapositions. Sometimes, she would limit her palette deliberately in order to explore certain combinations and patterns; however, over the years, she allowed more colour to enter. Since the mid-1960s, Riley has enjoyed widespread international recognition. Her works feature in a number of public galleries throughout the world and have been influential for many artists. She has been on the board of directors for the National Gallery in London, and in that context helped to save the land now occupied by the Sainsbury Wing from development. In 2003, she was given a retrospective at Tate Britain in London. Half a decade earlier, she had been made a Companion of Honour, a rare honour she shares with David Hockney and Sir Howard Hodgkin.